What Does a World Champ Do After Winning $10 Million? 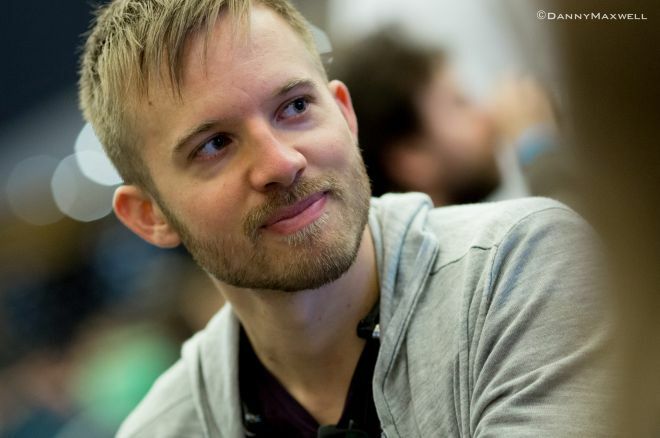 Marc Convey sits down with reigning World Series of Poker Main Event champion Martin Jacobson to find out what he has been up to lately. Martin Jacobson was one of the most popular winners of the World Series of Poker Main Event in recent times. So much has been written and said about his near-perfect display at the final table last November, and he was even rewarded with "Tournament Performance of the Year" at the European Poker Awards earlier this week. Enough about the cards though, because there are two questions on everyone's minds — what does one do with their time after winning, and how does one go about spending $10 million? Jacobson found time in his busy schedule to talk to PokerNews just after busting from the EPT Malta €10,300 High Roller. PokerNews: Tell us how you spent the 24-48 hours after you won the Main Event. Jacobson: Right after I won it was a really weird feeling. I was so focused on the tournament, so it was hard to switch off and start partying straight away. It took me a few hours to calm down and relax, but the first night I celebrated with everyone that was on my rail. The Rio put us up in a Palazzo suite with an open bar and it had seven bedrooms, a fireplace, and all this nice stuff. That was fun, and then the next night we had dinner at Mandalay Bay before going to Light Nightclub, so that was the real party. Everything had sunk in a little bit more and one of the guys who works there as a host was a friend of a friend and he put up the final hand on the big screen. They actually put it up twice, so that was pretty cool. It was different too as being in Las Vegas in November is not what you’re used to and everything is way more quiet and relaxed. It was a strange feeling having my family at the club for a bit, partying with my mom! A weird-but-really-fun experience. After that, did you head off on vacation? I stayed in Vegas a bit longer than expected because I had to sort some stuff out. I did a bunch of interviews straight away that week, and then the plan was always to go to Seal Beach in California where my friend has a house; stay there for a week or two and calm down. My girlfriend and I did that and relaxed for a bit before we went to Mexico for a week, which was really nice. It was just the two of us and it was something I really needed as even when we were in LA at Seal Beach, which is more like a small village 40 minutes out of the city, I was still doing a bunch of interviews. It was quite a stressful time for me with a lot going on and a lot of people wanting to talk to me. I was also dealing with a lot of emotions still, so it was so nice to get away to Mexico where I didn’t have to deal with any interviews or anything — I just switched off and relaxed on the beach for a week before heading back home to do more interviews. What was the festive period like for you? Christmas this year was pretty relaxed. I celebrated in London and half my family came over. My mom and dad are separated, so my dad came over this year. Angelica’s (Jacobson's girlfriend) parents are also separated, so her mom came over as well and we all had a relaxed Christmas back home in London. We know you’re a big mixed martial arts (MMA) fan and attended a UFC fight in Stockholm. Tell us about your involvement with those guys. It’s quite funny actually. There’s a guy I know through poker who did a documentary with Alexander Gustafsson (the biggest UFC star from Sweden). He used to work for Svenska Spel — the state-owned site that used to sponsor Michael [Tureniec] and Anton [Wigg], but he doesn’t work there anymore. Now he’s a TV producer for a big Swedish channel and he was doing this documentary. Originally, [Gustafsson] was supposed to be getting this title fight, but he got injured so the fight got postponed and then the champ got injured. Meanwhile, Alex had to take a new fight in between and it took place in Sweden. If he won, then he got a title shot again, so there was a lot at stake. Before the fight they were trying to hype it up, hence the documentary that was going to air on Swedish television, and they heard I was a big MMA fan so they suggested I be in the documentary. Originally he was supposed to make this documentary for the title fight so it was going to be much bigger and that’s when he thought that I could be in it. Unibet sponsored it, so they thought that I might be able to strike a deal with them and be in it while I was preparing for the final table. It would’ve been perfect timing as it was going to happen in October, so was right before my final table and I was going to go to San Diego to take part in his training camp to help prepare me. I was really excited about that and then really gutted when he got injured, postponing everything. The producer mentioned me to Alex’s manager, as he got to know those guys really well whilst shooting the documentary, and he said I should call him and we could hang out in Stockholm. I called him one day and they were really cool guys and they gave me the contact details on the new president of UFC Europe. I called him and he said sure, I’ll hook you up with tickets, and I got two floor seats, in the second row, for a friend and me. The fight took place at the end of January, so I went to Stockholm for four days and there was a pre-party. I also timed it pretty well as I got to do some interviews with some Swedish magazines while I was there. It was a great weekend for me and Kevin Stani, who’s a massive UFC fan and got me into it, so it was good to be able to bring him — a no brainer really. Have you had any other celebrity encounters since your win? While I was in LA I got to meet Nick Diaz, who’s another really famous UFC fighter. Just by coincidence, me and Mark Radoja stumbled across him outside a bar on a Monday night and next thing we know we’re doing shots with him before going to an after party, so that was a lot of fun. Then, I got invited to train at his gym in Las Vegas this summer while I’m playing in the World Series [of Poker]! Can you tell us about the patches you wore at the final table and the charitable pledges you’ve committed to? When I made the final table there were two things I wanted to do apart from the technical and mental preparations. I wanted to get a sponsorship deal and I also wanted to do something for a charity, as it was a really good exposure opportunity for both of those things. Since poker is pretty dry these days it’s hard to get a deal with a poker site because the market isn’t what it used to be, in Sweden at least. Going with a poker site might’ve been the most profitable thing for me. They were the ones able to offer the most money, but it wasn’t worth it for all the commitments. I thought it would be more fun to seek sponsorships with companies that I think are fun and products that I use. I managed to get sponsored by a supplement company whose products I was using all summer. They were a new starter company too, so were really excited about having me involved. The other part I wanted to do was to get involved with a charity, but I didn’t have the time to research as much as I would’ve liked. However, I had heard of this REG (Raising for Effective Giving) initiative. I went on their website and read what it was all about and it seemed perfect for me, since I didn’t have time to do the research myself. They analyze hundreds of different charities to find the most effective ones and since several of my good friends are involved, and I trust their judgement, I went with my intuition and decided it was exactly what I wanted to do. I signed up and pledged to give five percent of my winnings. Where exactly will your pledged money go? How it works is that they go through as many charities as they can, to find the most effective ones, where the money does the most benefit, and have 10-15 listed on their website. Then what you do is donate every quarter out of whatever you’ve been winning. If you haven’t been winning, you don’t have to donate anything. You can choose specific charities if you feel stronger about something. I feel stronger about animal charities, so I chose to donate half of the money towards them and spread it across many different ones. There are some that focus on factory farming and try to help find a better environment for those animals. The other 50 percent went to a meta-charity that aims to get more people involved in charities, host seminars, advertise, and generally get more people on board. This is an ongoing commitment now, too. Every quarter I’ll give five percent of my potential winnings. Lastly, have you bought anything nice for yourself? I just bought a house in London actually! It’s nice to be able to upgrade (laughs) as London is so expensive. Our current place is underground (a basement apartment), so it’ll be nice to live above ground. Free money offers* to kickstart your bankroll! * Only in applicable territories.